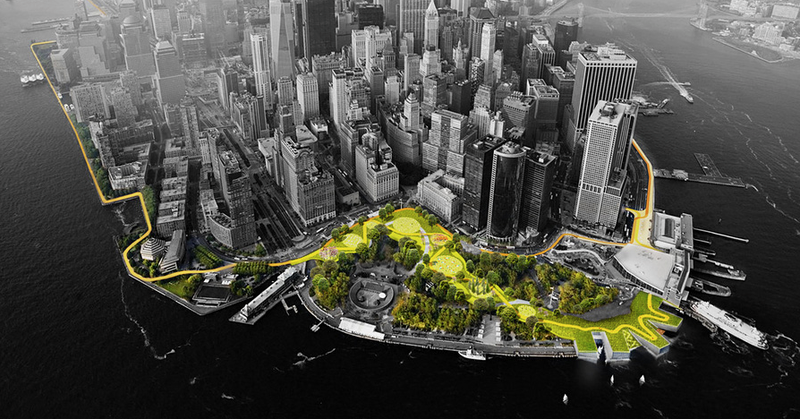 In 2014, New York City funded a proposal called the “Big U,” a 10-mile barrier around Lower Manhattan to prevent the devastating effects of both storm surges and sea-level rise. The biggest strength of the $540 million (£419m) project was that the infrastructure would do double-duty by adding parks and public space around the perimeter of the island. But due to cost issues, those plans might not happen at all, according to a story in Rolling Stone. 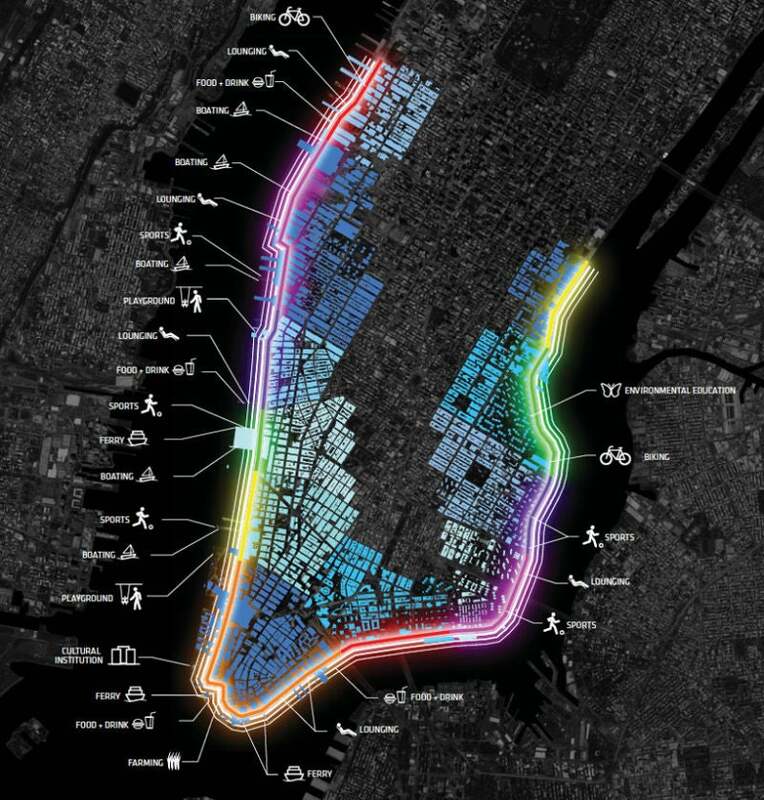 “Can New York Be Saved in the Era of Global Warming?” looks at how climate change will radically reshape New York City in the decades to come. One of the biggest changes will be the construction of the Big U, a “sponge” that will help to insulate the city against the next Storm Sandy (or worse). The promise of the Big U, which is being designed by the Danish firm Bjarke Ingels Group, is that the 16-foot-high (4.8m) steel and concrete berms will be cleverly disguised as skate parks, public pools, urban farms, bird sanctuaries, and marshland trails. Author Jeff Goodell talked to several architects and urban planners who say this plan is not happening anymore due to cost and complexity of the project. “When it’s done, it’s just going to be a big dumb wall,” one said. Building a wall is generally a frightening proposition to local residents, who want to be on the “right” side of the wall or want to protect their property values by not having a wall at all. Just look at Hoboken’s ongoing battle against its sea wall — designed by OMA — which is in limbo now due to vicious community opposition. In Manhattan, the location of that big dumb wall is another big problem. It’s clear that the wall — and most flood-proofing — is designed to protect Wall Street and its assets. But there are arguments that the community of Red Hook, the waterfront community in Brooklyn, will suffer consequences many magnitudes more severe. In parts of the Netherlands, barriers are required to protect from a one-in-10,000-year flood; in New York, most government agencies require protection only for a one-in-100-year flood plus 30 inches of sea-level rise. A barrier like the Big U would in theory be designed to protect from another Sandy, but not much more. (And by 2100, Sandy-like events are predicted to happen far more often.) I asked Kai-Uwe Bergmann, a partner at BIG, why the barrier wasn’t designed to withstand, say, a 500-year flood: “Because it’s infinitely more expensive,” he said.